From my years of traveling to international competitions of varying levels, I’ve seen a lot of things that I wouldn’t mind seeing at national events. One of my favorite things at international competitions is the punctuality and organization. It is a known fact that at national competitions- whether they be North American Cups, Super Youth Circuit events, or local competitions- they never run on time. I always feel significantly more organized, when I know what strip to be on, and exactly what time I need to be focused and ready. It’s not as stressful as having to listen to referees calling out different names, and constantly shuffling through direct elimination sheets for the order. Another wonderful thing about international competitions, is that you always see the same referees. While I may not love every single one of them, I at least have an understanding of what calls they tend to make. When I step onto the strip, I don’t have to focus as much on what will or will not be called. It seems as if I’m constantly seeing new faces at every North American Cup. This puts a lot more stress put on the bout. Instead of putting all of my energy on my actual opponent, I have to decipher what actions are favored, and which aren’t accepted; it’s undoubtedly very distracting. While it’s great that we have so many different people committing so much of their time as referees to help make our competitions run smoothly, the more consistent the competitions are with who the referees are, the better. Knowing who my opponents are going to be the day before is also another positive aspect. Being able to come up with a game plan for each competitor that I will have to face in pools, is a huge advantage. I am one of those fencers who has a notebook filled with notes on fencers, and I like to read it before a competition. It is also beneficial that many international fencers can be found on YouTube. This makes it much easier to come up with a solid plan of action, resulting in confidence. When competing in national events, we always see the same kind of venue. Practically every North American Cup is hosted in a convention hall. We have quads with railings, the same bright lights, and the exact same concrete floors. If you were to describe any one of those venues to me, I would never be able to tell you what city it was hosted in. However, when it comes to international competitions, they’re always in a different setting. Some of these may be worse than others, but it is always a nice change of scenery. This doesn’t apply to every single international event, but a sufficient amount of them put a lot of effort into the presentation of the top finishers. Nearly all of the senior events that I have participated in, the top 4 is always announced, prior to competing, as well as the officials. Of course, the top 4 is also awarded medals in a similar manner. This makes the achievement feel even more impressive. There have been many North American Cups, during which I have fenced on the finals strip and my peers had no idea. That’s unheard of at international events. Some of these things are probably impossible to incorporate into national events; nevertheless, it still would be refreshing to see us taking steps to improve our domestic competitions by using the international model as a base. You can help support Monica by Liking her athlete page on Facebook and following her on Twitter and Instagram. You can also help me by clicking here to like myFacebook Page , Jonathan Yergler – The Fencing Athlete, and here to follow my Twitter handle @yerglerj. Or you can follow me on Instagram @yerglerj. The coolest saber touches from 2014 from CyrusofChaos (aka Andrew Fischl). Enjoy! The very nature of Fencing means that we have all experienced losses, frustration, and disappointments. Looking back, throughout my career there are a few such moments that still register strongly, and to this day I can feel the resulting sting of self-doubt and immense disappointment. Whether we are just starting out or multiple time World Champions, we all encounter such events. They can stem from a bad lesson or day at practice, or in two time World Champion and multiple time number one in World ranking Nikolai Novosjolov’s case, two back to back under-performances this season (eliminated in the pool round at European Championships and a first round loss at World Championships). While it is not possible to avoid such losses (trust me, I’ve spend over a decade trying), it is important to learn how to take such experiences as what they are; important motivational and learning lessons. If I could point to any one thing in my past which has greatly contributed to my successes, it would be my ability to take setbacks and losses as reasons to endure even harder. Rather than quit, which was often my first thought, I chose to rise above the setback and use the emotion as a means to dig my heels in and work twice as hard. Like every other pursuit we have in life, how we handle setbacks and disappointments is vitally important in determining whether we will be successful or not. It is easy to win and continue forward, but the true tests and hurdles we encounter in any pursuit of a dream or goal is learning to move forward after devastating setbacks or season ending losses. The first experience that cast doubts on my ability to succeed, was when a top coach once said to me that I really needed to consider whether I should continue to fence or not. I was 14 years old and taking one of my first Foil lessons, my primary weapon at the time. I was failing so miserably that the coach felt it appropriate to say those words. I acknowledge that I was not very good. I had fenced only in Vermont, recreationally for about two years, and having shown a passion for the sport decided to participate in a fencing camp in Montreal. Looking back, I realize that the words struck me as true, and that I did not show a particularly strong technical understanding of the sport. Being so far behind my peers at that age group, I realized the I did in fact need to decide whether Fencing was something I should devote my time to or not. Ultimately, I could have easily quit, and moved on to another pursuit. Instead, I chose to work even harder to not only prove to the coach but also to others, (including myself), that I did have what it takes. I chose to devote countless hours of my life working hard to get better, even when my only opponent was often a martial arts dummy in my garage. A year and a half later, I would make my first top 4 finish at U.S. National Championships, albeit in Épée, and by the year’s end qualify for the U.S Cadet World Team. The second experience that initially cast doubts on my ability to succeed, was my NCAA college fencing career, which was riddled with under-performances. As a top Junior and competitive Senior in national rankings, I went into college with high expectations and the goal of becoming NCAA national champion. Following Sophomore and Junior year close losses in regional qualifiers to my two teammates, I was unable to participate in the Championships. After each season, the losses to qualify, even while maintaining top 8 in collegiate and national team rankings, caused me to seriously doubt myself. It was the high pressure situation in both seasons when I was unable to perform at the level I knew I was capable of. This frustration in back to back seasons caused me to doubt whether I had what it takes to overcome the stress under such critical moments. This having been a problem in previous seasons, I was incredibly disappointed in myself, and with fencing in general. Ultimately, I chose to dedicate myself even more as soon as my college season had ended abruptly. In each of these frustrating losses, I decided to push myself a little bit harder instead of succumbing to the defeat and giving up. The final chance at the NCAA title was in my senior year, but I suffered the bad luck of an ankle injury the week before NCAA championships. Fortunately, I was still able to finish 12th place and earn all American honors. The same season, I graduated college and immediately qualified for the U.S Senior World Team. If I had let my defeats and setbacks get to me and cause me to work any less hard or lose interest in the sport, I would have never overcome these challenges and thus miss out on some of the most incredible experiences of my life. Ultimately, it is important to see losses and setbacks as tests and learning experiences we must overcome in order to achieve our ultimate goals and dreams, and not let them deter us from our bigger objectives. There are numerous examples of Fencers winning or becoming medalists in World Championships after over a decade of failed attempts. I see the dedication, persistence, and ability to overcome adversity and losses as the critical element in determining the success of top athletes over time. Examples of some of the greatest athletes across a broad range of sports, from Michael Jordan who overcame his early struggles to later become generally viewed as the greatest player of all time, to Tom Brady who throughout college was seen as a mediocre quarterback at best to becoming multiple time Super Bowl champion and earning a place among the all-time greats, and many others, provide vivid illustrations of the importance in overcoming a lack of immediate results and success. The importance of persevering through disappointments and losses, is a factor which has played a vital role in any great athlete’s career. It is something that we can learn the value of early on in Fencing, as its application transcends sports, relationships, business, and all different dimensions of life. -You can help support Adam by Liking his Facebook page. Whatever weapon you fence, if you are looking for a great drill to improve your distance, try the glove game. In this drill no weapon is needed. You need a partner and each of you needs a glove to hold. The fencers start on the en garde lines and take turns trying to hit their opponents with their gloves. The attacker may only use a maximum of two advances and a lunge while the defender may use whatever footwork they want. While two advances and a lunge is the maximum, the fencers do not need to use all of their steps during each attack. 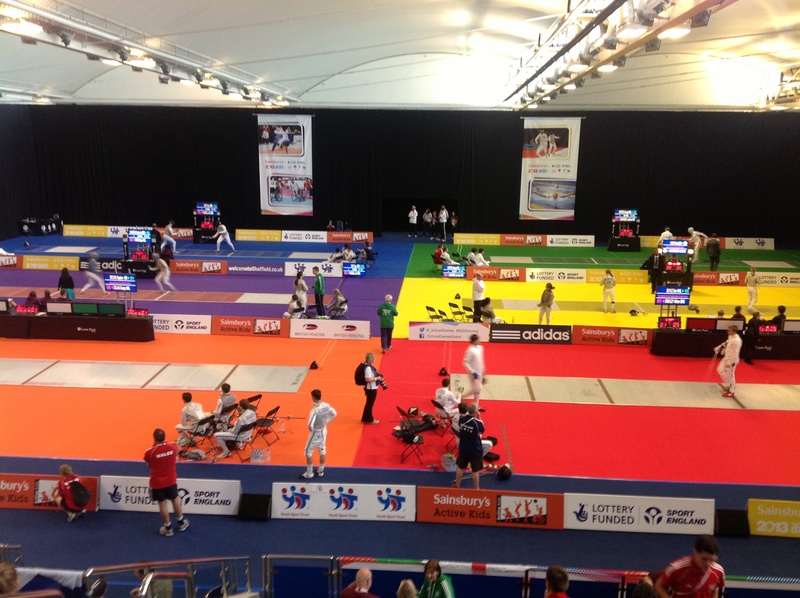 After each hit, the fencers reset to the en garde lines and whoever started first goes second this time. In this drill because of the relatively small amount of space that the fencers can cover while attacking, the defender must stay close and be prepared to change directions quickly when an attack ends. The benefits of this drill will be that the defender will learn to stop on a dime and take over immediately and the attacker will develop a sense of when their quick, surprising attacks will be able to hit their opponent. This will help them figure out their distance for when to start an attack; an essential skill in any of the three weapons. This drill is particularly fun because once you get comfortable with the basics of it, you and your opponent will basically be bouting. The most common mistake made by the defender is giving up too much distance on defense. Unlike in an actual bout, the point of this drill is to keep the distance tight so you can take over as soon as possible when your opponent misses. If you frequently pull the attack short by running away and giving up your chance to make a riposte you are missing the point of the drill. As for the attacker, I will often see the attacker only using their full amount of steps for attacking, even if it puts them in a bad position. Unlike in a real bout situation an attack in the glove game has a definitive end. This is so that both you and your opponent can figure out the distance more accurately. I have seen situations where beginners play this game and the defender figures out the distance before the attacker does and waits right on the edge of distance for the attacker to make a full double advance lunge that has no chance of hitting and then just get immediately popped afterwards for their mistake! This game requires thought as much as good balance and footwork so don’t be scared to play around a little! Try it out at your next practice but since everyone has different timing, this game should be played against more than one opponent for optimal results. Everyone knows that the harder you train, the better you become right? Well, in fencing it’s not always that simple. In sports like running and swimming, you keep getting better by pushing your limits in practice. No matter what level you are at, this principle remains constant. The amount you improve is a function of the amount of work you put in. In fencing, after the first few years, the two aren’t necessarily as correlated. The effort and grueling physical demands you put on yourself don’t mean as much if you don’t train right. What makes it even trickier is that frequently it’s not 100% clear as to what “right” really is for your fencing at a given time. You can do 5000 lunges every day, you can do hours of grueling footwork, but if you are not focusing on these improvements within the context of a larger, overall plan, you end up spinning your wheels, devoting hours of work but reaping less and less real improvement per hour spent training. Take the lunging example for instance. After 5000 lunges, you will undoubtedly get stronger lunging muscles (after allowing yourself to recover of course). But you won’t have spent any of that time focusing on when to pull out that lunge and while the power and speed of that lunge is important, it’s not nearly as important as knowing exactly when to unleash it. You may have even been training yourself to resort to that lunge when you are tired. Ask yourself why you are doing what you are doing in practice. Ask yourself how practicing whatever it is the way that you are directly builds into your overall fencing game. Instead of pushing as hard as possible to do the same movements faster and with more repetitions, try to practice those movements smoother, or even differently. Try to get a feel for how you might actually implement those movements in a bout. Focus on smoothness or being able to respond in a specific tempo. Ask yourself if you really are ever going to be mindlessly running up and down the strip at full speed when you fence or if you would be better served focusing on ways to change speeds smoothly and manage the distance more efficiently. I’m sure many of you are familiar with the adage, “Work smarter, not harder.” Due to the insane number of mental and physical variables in fencing, this is especially true at the intermediate and advanced levels more than in other sports. Of course, you need hard work if you are going to get yourself to the next level. It’s just important that you have a plan for how exactly you are going to practice to drive the specific improvements you want. Work with your coach so that you have a clear set of objectives for each practice session and you will get much more out of it. Let’s put it this way: If you want to improve, you have to train both smarter and harder. If you liked the article, click here to like Jonathan’s Facebook Page , Jonathan Yergler (athlete), and here to follow his Twitter handle @yerglerj.